We’ve hit an all new low at Fremont Chevy Buick GMC. For a limited time, we are delivering Rock Bottom prices. 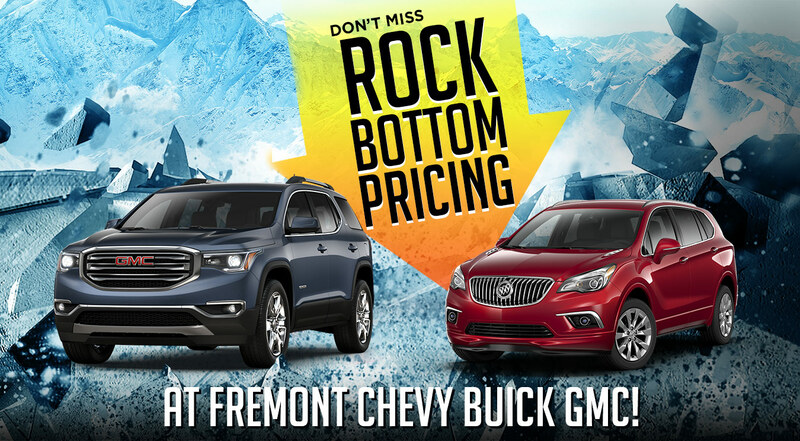 Check out these savings at Fremont Chevy Buick GMC in Riverton. STK # 8B17010 & 8B17009. Price includes all applicable dealer incentives and manufacturer rebates and are based off MSRP of $43,475. Not all buyers will qualify. Current offers are not available on prior purchases or pre-negotiated deals. Prices plus tax, tag, title and dealer fee. See dealer for details. Offer expires 02/28/2018. STK # 8G18030. Price includes all applicable dealer incentives and manufacturer rebates and are based off MSRP of $31,608. Not all buyers will qualify. Current offers are not available on prior purchases or pre-negotiated deals. Prices plus tax, tag, title and dealer fee. See dealer for details. Offer expires 02/28/2018. STK # 8G18007. Price includes all applicable dealer incentives and manufacturer rebates and are based off MSRP of $42,684. Not all buyers will qualify. Current offers are not available on prior purchases or pre-negotiated deals. Prices plus tax, tag, title and dealer fee. See dealer for details. Offer expires 02/28/2018.